In South Africa, potjiekos (literally meaning ‘pot food’) has been part of South Africa’s heritage and culture for many centuries. 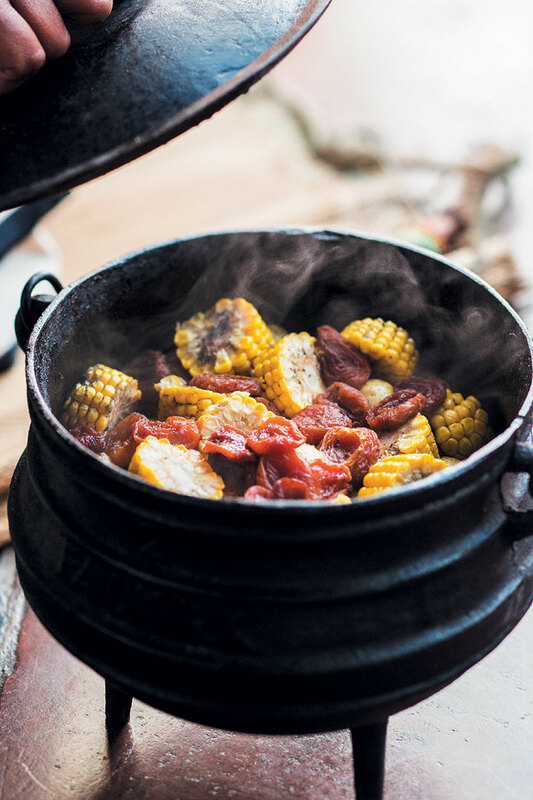 Cooking food in a potjie, also known as a ‘phutu pot’, is, in itself, an occasion to be celebrated by all South African cultures, regardless of race. Imbizo Shisanyama or ‘Busy Corner’, as it is affectionately known, has taken this delicious and much-loved tradition to new heights with its rich South African impala potjie. Potjies are traditionally made around an open fire, preferably in the company of good friends or family celebrating memorable moments, with one or more potjies simmering away. Heat half of the sunflower oil in a medium traditional potjie pot over a hot braai. Sauté the bacon, if desired, until crispy. Add the onions and continue to sauté until the onions are golden brown Remove the bacon and onions from the pot and set aside. Add the remaining sunflower oil to the pot and brown the impala cubes. Remove from pot and set aside. Add the carrots and sugar to the pot and sauté until the sugar has melted and the carrots are caramelised. Begin layering your potjie pot with the ingredients, starting with the impala cubes, bacon and onion mixture, carrots, baby potatoes, corn chunks, spices, salt and pepper and apricots. Add the red wine and stock and leave the potjie to cook, about 4 hours. Serve your potjie with traditional African ipapa, samp, mealies or rice. Potjies can be made with any type of meat, including beef, lamb, chicken, venison or even pork. Potjie seasonings are another highly personal choice – some of the more popular options include fresh garlic, ginger, thyme, marjoram, coriander, curry powder, cinnamon, paprika and cardamom. Use 5ml – 10ml (1 tsp – 2 tsp). For extra South African flair, add traditional African dombolo to simmer and cook in the impala potjie at the very end.